To better understand the critical role of headwater streams and wetlands in our forest ecosystem, long-term measurements were initiated in 2005 on two small watersheds in the Prospect Hill Tract of the Harvard Forest. On Nelson Brook, weirs were installed on outlet streams of an 11-ha spruce-hemlock wetland (watershed area = 44 ha). On Bigelow Brook, pipes were installed to measure flow above (watershed = 24 ha) and below (watershed = 65 ha) a 3-ha shrub-dominated beaver swamp. The gaged watersheds, though adjacent and comparable in size, differ significantly in topography, soils, wetlands, stream chemistry, stream biota, land-use history, and forest vegetation, and provide an extraordinary opportunity to study the impacts of these factors on small watershed hydrology and ecology. Weekly manual measurements were initiated in April 2005. Continuous automated measurements were initiated in December 2007. Data for the current month are available online, updated every 15 minutes, with out-of-range values replaced by NA but values not otherwise checked. Earlier data are checked and archived with missing, questionable, and estimated values flagged, following methods of the LTER ClimbDB project. A log of events affecting station measurements is also posted. For current data, please see: http://harvardforest.fas.harvard.edu/meteorological-hydrological-stations. For a complete set of archived data, please see: http://harvardforest.fas.harvard.edu:8080/exist/xquery/data.xq?id=hf070. See online map for locations of gages and watershed boundaries. Note that the two Nelson gages measure discharge from the same watershed (parallel outlets), while the Bigelow gages measure discharge from nested watersheds. Nelson Brook flows northwest to the Millers River and Connecticut River. Bigelow Brook flows southeast to the Swift River, Quabbin Reservoir, Chicopee River, and Connecticut River. Nelson Brook Big Weir (NB). 120-degree V-notch weir with rectangular spillway. V-notch height = 10 in (25.4 cm). Spillway width = 13 ft (3.96 m). Watershed area = 44 ha. Nelson Brook Little Weir (NL). 120-degree V-notch weir with rectangular spillway. V-notch height = 4 in (10.2 cm). Spillway width = 5 ft (1.52 m). Watershed area = 44 ha. Bigelow Brook Lower Pipe (BL). Corrugated polyethylene pipe with smooth interior. Diameter = 30 in (76.2 cm). Length = 16 ft (4.88 m). Slope = 0.01087. Manning coefficient = 0.012. Watershed area = 65 ha. Bigelow Brook Upper Pipe (BU). Corrugated polyethylene pipe with smooth interior. Diameter = 24 in (61.0 cm). Length = 10 ft (3.05 m). Slope = 0.01969. Manning coefficient = 0.012. Watershed area = 24 ha. Black Gum Swamp (BGS). Nelson Brook watershed. Wetland area = 11 ha. Beaver Swamp (BVS). Bigelow Brook watershed. Wetland area = 3 ha. Water levels at weirs are measured with attached gages (relative to notch). Water levels inside pipes are measured with ruler and chalk 40 cm from downstream end. Water levels in BGS and BVS were originally measured in an existing well (relative to soil surface) and at an existing gage (relative to 3.28 feet), respectively. In fall 2008 new gages for automated measurements were installed at new locations in each wetland. Bigelow Lower Pipe was replaced on 16-Oct-2006. Before that date, the pipe was corrugated steel with a partial asphalt liner, diameter = 36 in (91.4 cm), length = 16 ft (4.88 m), slope = 0.01087, manning coefficient = 0.019. Water level: Druck 1830 2.5 psig pressure transducers. Water temperature: Campbell 107 temperature probes. At weir sites, instruments are mounted on steel brackets attached to the weirs. At pipe sites, instruments are mounted in wells 30cm below the bottom of the stream channel and 1 m upstream from the pipe intake. At wetland sites, instruments are mounted on vertical pipe 60cm below average water level. At each site a permanent manual gage may be used to check instrument readings. Instruments are scanned every 10 seconds and 15-minute average values are retained. All times are Eastern Standard Time. Stream discharge is calculated from water level (stage) using standard flow equations. At pipe sites, water depth in the pipe is estimated from measured stage using empirical rating curves. Daily values are calculated from 15-minute measurements. Data are checked and posted with missing and estimated values flagged, following methods of the LTER ClimDB project. A log of events affecting station measurements is also posted. Gages are not heated. Ice is removed regularly in winter to ensure proper flow through the gages. At Nelson Little Weir, instruments are removed in mid-winter to prevent ice damage and discharge is estimated from measured flow at Nelson Big Weir. Boose E. 2018. Prospect Hill Hydrological Stations at Harvard Forest since 2005. 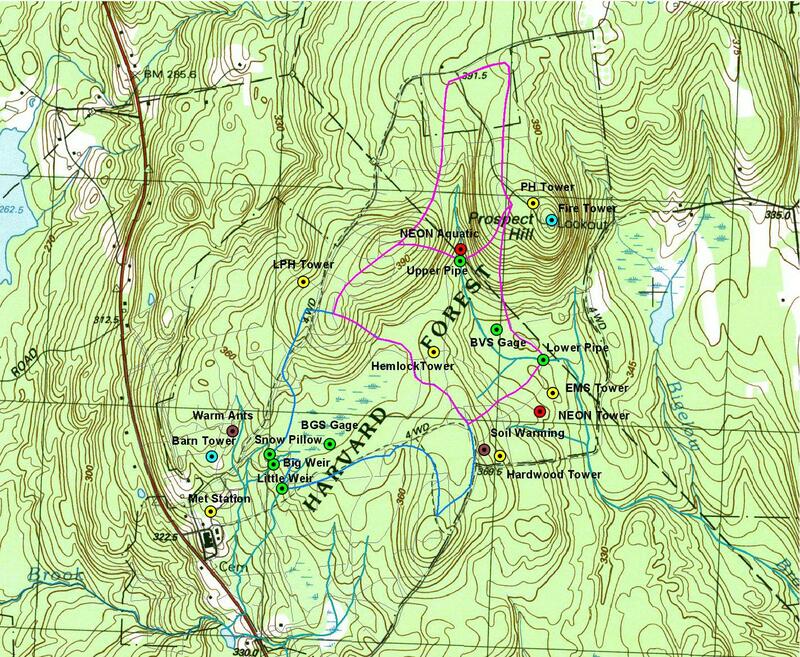 Harvard Forest Data Archive: HF070. E: Missing. Instrument not installed, instrument not working correctly, or measured value out of range. M: Estimated. Value estimated from incomplete measurements or from other sources.